In A Current Deception excitement and intrigue abound with murders and an invasion of yellow crazy ants aboard a cruise ship. 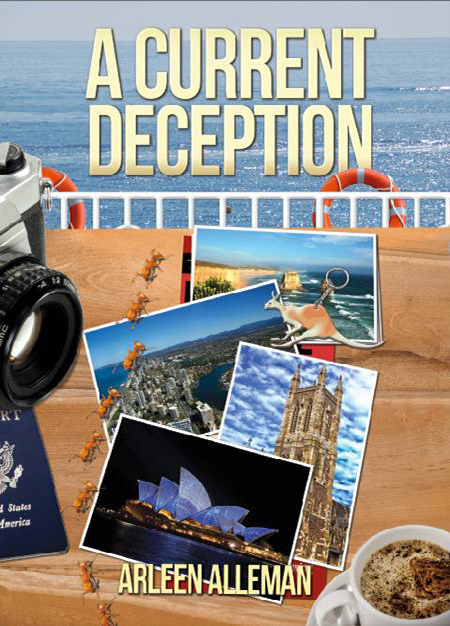 Freelance reporter Darcy Farthing and her new husband, government investigator Mick Clayton, board World of Seas Cruise Line’s luxury ship the Sea Star for a honeymoon trip around Australia. Darcy’s daughter Rachael accompanies them with her infant daughter Anna. Also along for the ride are Darcy’s best friend, Sid, and her fiancé—also Darcy’s ex-husband—Brooks, who plan to marry onboard the ship. Brooks is CEO of American Travel Corporation and this is a working vacation for him, since he is accompanying a tour group—nine small town Kansas residents celebrating their twenty year high school class reunion. Also on board are Darcy’s friends Don and Charlie and their gifted and perceptive eight-year-old daughter Penelope who is still recovering from an abduction that occurred several months ago. Alice Barton, a member of the Kansas group, is an innocent woman enjoying her first cruise. From day one she is plagued by bizarre incidents. First, a mysterious waiter delivers a plate of fruit to her stateroom covered with dangerous and invasive yellow crazy ants. Someone then cancels her onshore tour, and she is the only person on board who becomes seriously ill from a mysterious food borne pathogen. These incidents are mostly annoying, but it is soon apparent that someone is purposefully targeting her and other passengers. The crimes escalate and turn deadly with a hit and run killing on the street in Adelaide. The ship’s chief of security is inexplicably reluctant to conduct a thorough investigation even though it is obvious that a dangerous individual is onboard. When evidence is found in Brooks’ stateroom, the chief names him as the suspect and tries to close the case. For Darcy, the search is on for a waiter thought to be responsible, and she puts her skills and biology background to work to conduct her own enquiry. After interviewing crew members and victims, she identifies troubling clues indicating that someone impersonating a waiter deliberately contaminated food and water at the spa. Is this person also a murderer? Is that crime linked to the ant invasion, or other crimes? With no way to identify a suspect, Darcy is ready to give up until another Kansas woman is attacked and nearly killed. Darcy and Mick tap into their government sources back home for information and are shocked to find a puzzling link between the events on the ship and a brutal twenty-year-old crime. Meanwhile, Darcy is concerned about Rachael’s budding shipboard romance with a friendly handsome passenger, Noah Stevens. She is supposed to be in a relationship with her baby’s father who lives in Kenya. For that reason and due to Darcy’s complicated relationship with her biological daughter, she believes Rachael’s new friendship is becoming too intense too quickly, but is reluctant to say so for fear of alienating her. Noah is a great guy liked by everyone with the exception of Penelope, who is acting out and appears jealous of the time he spends with Rachael and her baby. So, in Darcy’s typical objective fashion she decides to suppress her misgivings and to be happy for her daughter. As the ship approaches Sydney on the final day of the cruise, the security chief disappears and another passenger dies. Penelope provides a final clue when she is frightened by the appearance of a waiter who she insists looks like someone else entirely. Darcy and Mick finally discover that several individuals on the ship are not what or who they seem. Through identity theft, masterful disguise, and access to the ship’s computers, a skillful computer hacker and murderer is hiding in plain sight. By the time the Australian police and FBI board the ship in Sydney, Darcy and Mick have identified and captured a brilliant homicidal master of deception living in their midst.